at the University of Glasgow and Alexander Russell at the University of Dundee. Solar flares are popularly thought of as ‘explosions’ in the solar corona, but of course that cannot be the whole story. Plasma which is really exploding should expand the magnetic field that is entrained in it, and this takes energy (in addition to what is necessary to accelerate plasma upwards in the gravitational field). To power the radiation, mass motion and particle acceleration that characterise a solar flare the energy must be extracted from the magnetic field instead, which in turn means a reduction of the volume integral of the magnetic energy density ∫(B2/8π) dV . The diffusion timescale for magnetic field in the corona is long but the impulsive phase of a flare is short, so most of the energy must come from a reduction in volume (i.e. from the shortening of the current-carrying field) somewhere in the configuration , referred to as the ‘implosion’. Observations of implosions have been reported before [e.g. 3, 4], and in this nugget we report on a particularly nice example seen by the Solar Dynamics Observatory (SDO), which shows also that the start of the implosion is simultaneous with the onset of electron acceleration seen in hard X-rays and radio. The M6.4 flare on 9th March 2012 was observed by several instruments, among them SDO which tracks the dynamics of the coronal plasma and the evolution of the flare’s ultraviolet footpoints. The characteristics of heated and accelerated electrons in the flare come from the Nobeyama Radio Heliograph (NoRH) and Polarimeter (NoRP) which reveal the (mostly) gyrosynchrotron radiation from fast electrons gyrating in strong magnetic fields, and from the bremsstrahlung measurements made by the Ramaty High Energy Solar Spectroscopic Imager (RHESSI). A movie of the flaring region is shown in Figure 1. We will concentrate on the dynamics of the four loops marked L1 to L4 in this movie. Figure 1: Movie of the active region where the flare takes place. Four loops showing shrinkage and oscillation are picked out. A slit is chosen along the line formed by the four arrowheads in Fig. 1, and the stack-plot of the AIA 171 Å intensity along the slit as a function of time, in Figure 2 below, shows several stages of evolution. In the 30 minutes or so before the flare the upward trend of the loops suggests field expansion or inflation, particularly in association with two smaller flares in the final few minutes before the M6.4 flare. This is followed by a rapid contraction with superposed oscillations, and a disappearance from the upper part of the image of the million-degree plasma seen by AIA 171 Å (the flare dimming). 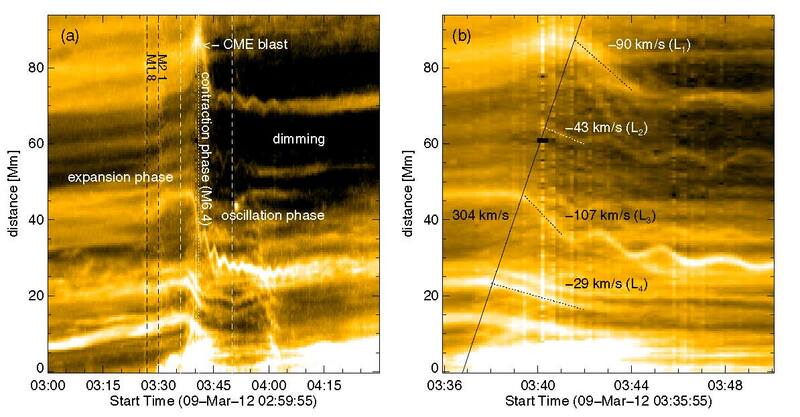 If we zoom in on the few minutes around the M6.4 event’s impulsive phase, the rapid shrinkage and oscillation of the four loops L1 to L4 is obvious, as is the fact that the shrinkage starts later for loops farther from the core of the flare, shown by the intense EUV brightening at the bottom of the frame between 03.37 and 03.45. This is consistent with the field shrinkage starting in the core of the flare where the energy density is highest, and the signal that the magnetic pressure has changed then propagating outwards at something like the fast-mode speed. We have fitted the onsets of the implosion to a straight line, giving a projected speed of around 300 km/s (a straight line fit is probably incorrect, as the fast-mode speed will vary though the corona, but it gives an order-of-magnitude estimate). Figure 2: Time stack-plot along a slit taken through the loops to the south-east of the flare region, showing pre-flare expansion, followed by shrinkage, oscillation and coronal dimming. 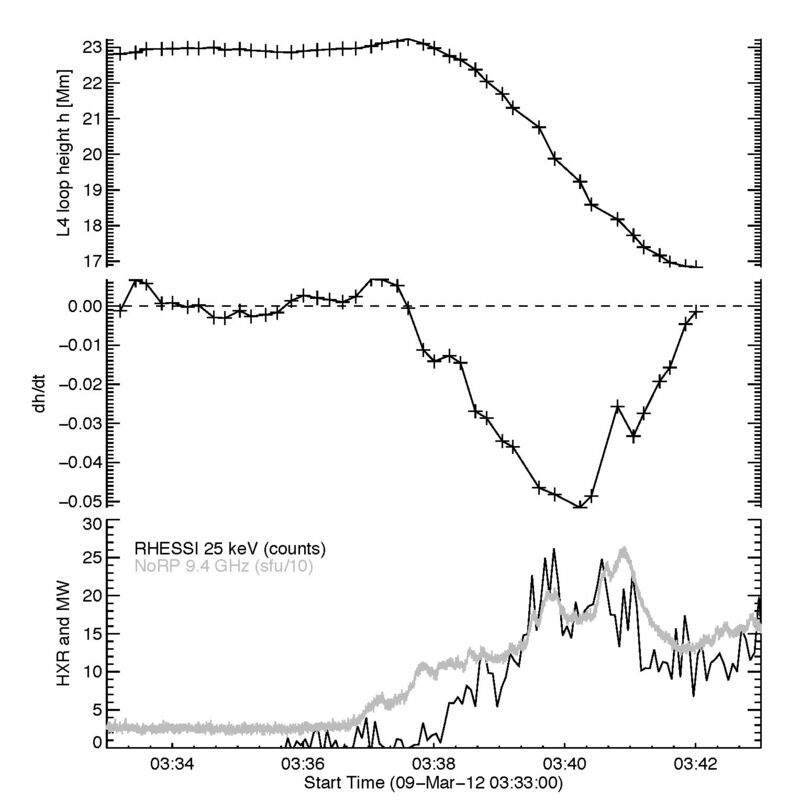 In the LH panel, the times of two previous flares are shown by vertical black dashed lines, and the M6.4 flare happens between the two vertical white dashed lines. Figure 3: The top panel shows the distance from the flare core (here called ‘height’) of loop L4 as a function of time. Below this is the time derivative of this, and the RHESSI 25-45keV and Nobeyama 9.4 GHz lightcurves. The impulsive phase of a flare is heralded by both the intense radiation flash (seen for example in the EUV and UV by SDO), and by large numbers of accelerated particles. The close correspondence between the onset of the implosion and the impulsive phase is already hinted at by the simultaneity of the backwards-projected start time of the implosion with the bright EUV emission in the flare core. We can also see it very strongly when we compare the position along the slit of one of the loops, and the time derivative of this (i.e. the shrinkage speed), with the hard X-ray and radio time profiles measured by RHESSI and NoRP, which roughly track the rate of magnetic energy conversion into the kinetic energy of non-thermal electrons, all shown in Figure 3. The rate of change of the loop position, giving an indication of the rate of field shrinkage, is well correlated with these, starting and peaking around the same time. Based on the timing of thermal and non-thermal flare signatures, and the motion of magnetic loops in the corona, this flare shows strong evidence that the main release of flare magnetic energy coincides closely with the shrinkage or ‘implosion’ of coronal magnetic field. From other lines of evidence, we can be fairly sure that the energy for a flare is stored mainly in strong field, low in the corona and close to the polarity inversion line , so the shrinkage we see in these more distant outer loops is therefore energetically rather insignificant. However, it does show us that the more distant corona responds and readjusts to the reduction in core magnetic energy caused by the flare. This flare shows many other interesting features, including the loop oscillations seen in Figure 2, their soft X-ray counterparts, unusual microwave footpoints, and a beautiful, oval expanding flare wave. Full details of the event can be found in . Hudson, H. S. 2000, ApJL, 531, L75. Melrose, D. B. 1995, ApJ 451, 391. Liu, R., Wang, H. and Alexander, D. 2009, ApJ 696, 121. Liu, R., Liu, C., Török, T., Wang, Y., Wang, H. 2012, ApJ, 757, 150. Sun, X., Hoeksema, J. T., Liu, Y., et al. 2012, ApJ, 748, 77.